Mennonites’ children of Latin America. Nazis and Mennonites were attracted to each other both before and after the German invasion of the USSR in 1941. After the Third Reich’s demise, it took multiple ruses to sufficiently convince the Western powers of Mennonite innocence. These are a few of the claims made by the historian Ben Goossen at Pennsylvania’s Mennonite World Conference in July 2015. S m o l e n s k — Nazis liked Mennonites. That’s the jolting message delivered by Ben Goossen, a doctoral student at Harvard University, in a lecture at the Mennonite World Conference in Harrisburg/Pennsylvania last July 22. He backed up his thesis with a large photo of the infamous Nazi Heinrich Himmler visiting the Mennonite Molotschka colony (today Molochansk) southeast of Zaporozhye/Ukraine in 1942. Mennonites outside of Germany were celebrated for years as the “purest” and most convincing examples of German ethnicity (“deutsches Volkstum”). Goossen referred to SS documents citing Mennonites as an “outstanding example of avoiding kinship with their surroundings”. The Nazi movement was “impressed by Mennonites’ ability to prosper in pockets around the world while retaining a German language and identity. 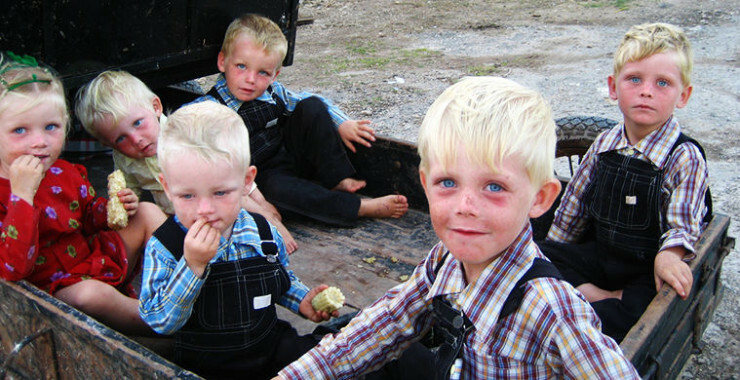 . . For 400 years they had essentially created a racially pure community with pure blood lines.” According to Nazi racial biologists, “the Mennonites were more Aryan than the average German.” Seeking for ideal Aryan specimens, German biologists had as early as 1933 “examined Mennonites in multiple countries”. After the German invasion of the USSR in 1941, Mennonites went to considerable length to prove their Germanness. They later trekked westward along with the retreating German armies. Goossen points out that in places such as occupied Poland, Mennonites “passed through intense racial testing before receiving special rights as ethnic resettlers, accessing homes and farms taken from Poles or murdered Jews.” That was mostly in 1944. The author heard Peter Dyck himself say in 1989 that Mennonite men with a tattooed number on their arms were refused entrance to Canada after 1945. That number indicated service for the German SS. The destination which remained for such men was Paraguay. If this description is accurate, then it calls forth a bevy of questions. Was the sudden flip-flop of 1945 simply rank, industrial-strength opportunism, nothing more than an attempt to avoid reaping the consequences of what one had just sown? It was in any case the unfortunate minority of Mennonite refugees in West German camps, forcibly repatriated back to the Soviet Union in 1945-48, which vicariously got to reap the bitter fruits for all. Most of these were women and children. Attempting to save one’s own skin is an understandable human reaction. But would not repentance have offered a chance to re-win the hearts of Russians and Ukrainians? Practice leaves the impression though that the Christian teaching of repentance is an unusable category for political offenders. I would maintain that repentance and serious reflection did not occur in Western Germany prior to the student revolts of 1968. It is apparently only the offspring of perpetrators who – thanks in part to the benefit of hindsight – prove capable of honest repentance. One can of course claim Ukraine’s Mennonites – as well as the more numerous ethnic-German Lutherans and Catholics — rushed into the arms of the German “liberators” in 1941 only because of the ghastly treatment they had received at the hands of Stalin’s henchmen during the 1930s. But already in 1920, Pan-Slavists, Bolshevists and the anarchists of southeastern Ukraine had major problems tolerating the presence of closed-and-wealthy, ethnic-German communities. Who was most guilty? It’s a chicken-and-egg story. One can follow the guilt at least as far back as Catherine the Great, who invited the closed, ethnic community of Mennonites to Russia in 1789. Postscript – As part of the “de-Sovietization” of Ukraine, plans are afoot to give some streets in Zaporozhye region Mennonite names. These include a “Tissen”, “Gerhard Rempel” and “Andreas Wallmann” street. Yet the issue of fascism is only a small element within the entire picture. The “modern”, highly-educated Mennonite congregations of North America have today become essentially one section more of society’s liberal, inclusive mainstream. Some observers claim they are losing their young people in droves. It’s the conservative, ethnic minority which is clearly still holding its own. The old-time, 1920-founded “Mennonite Central Committee”, which is no longer active in Russia, is now smaller than the conservative, 1981-founded, Berlin/Ohio-based “Christian Aid Ministries”. Quo vadis? The primary source for this article is Tim Huber in “Mennonite World Review”, 24 July 2015. A subsequent conference took place in Münster/Germany, 25-28 September. The papers from that conference will be published by Germany’s “Mennonite Historical Society” during 2016. « Обвинения США против Путина выглядят очень рискованно: следующий шаг – ядерная война.